Greta Gerwig’s film Lady Bird is a masterpiece. Gerwig (Frances Ha, Mistress America) provides us an insight into life and a part of ourselves few films endeavor let alone accomplish. Lady Bird stars Saoirse Ronan (Atonement – AAN, Hanna, The Grand Budapest Hotel, Brooklyn – AAN) as a high-school senior experiencing all that comes with this time of life. Instead of being a programmatic re-tread of Hollywood story-line(s) and character(s) presented in out sized and or and overly simplistic form, Lady Bird feels real from start-to-finish. Ronan – as almost always – is perfect in the role. 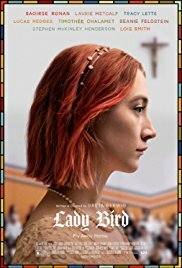 Better than any film in recent memory, Lady Bird shows us youth, age, inexperience, experience, warmth, cold, sincerity, insincerity, happiness, sadness, the ability to communicate feelings, and the lack thereof, the lack of appreciation and (ultimately) appreciation. Laurie Metcalf (Mom’s voice in Toy Story movies, The Big Bang Theory, Roseanne) and Tracy Letts (U.S. Marshals, The Big Short, Elvis & Nixon) are Lady Bird’s parents. Lucas Hedges (Manchester By the Sea – AAN, Moonrise Kingdom), Beanie Feldstein (Orange is the New Black), Timothée Chalamet (Interstellar) and Odeya Rush (Goosebumps) are Lady’s Birds circle of friends. Each of these six characters have roles that are rich and well developed. The actors prove to be more than capable in the role. Some with a level of true brilliance. If you have not seen Atonement (AAN Best Film 2007) do so. All five films nominated in 2007 (Atonement, No Country for Old Men, Michael Clayton, Juno, There Will Be Blood) were worthy of the statue. Atonement, Michael Clayton and No Country for Old Men are in the Lubeck film library and watched repeatedly. Gerwig is a strong actor. She is great at appearing to be completely self-centered with a total lack of self awareness. However her writing and directing skills may win the day. The personality of Hedges character in Lady Bird is a 180 degree turn from that in Manchester By the Sea – a performance for which he was nominated for an Academy Award. He is so convincing in both – uncanny.